Great Eastern recently launched the 1st medical extender plan with adverts running in major newspapers & billboards planted across the country. 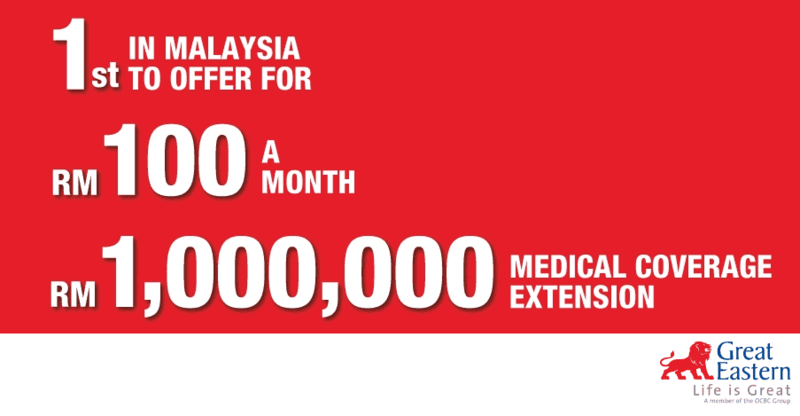 What does a RM1,000,000 medical coverage extension mean? Is it something I need? The most popular and important insurance plan in Malaysia is medical insurance. However, not everyone may want to upgrade/get new medical coverage with a higher medical limit due to costs or other constraints. Or you may have decided in the past to pay for medical costs in cash. Smart Extender Max helps fulfill this need. Why are medical annual & lifetime limits a concern? Medical inflation as reported by Malaysia’s Ministry of Health in 2014 is at a whopping 23%. The estimated rise of medical inflation after Apr 1 is 14.4%. Are you prepared for medical inflation especially in 10 or 20 years time? Is your medical plan sufficient to cover you for the next 10 years (and beyond)? What if your health status declines, you can no longer purchase a new or upgrade your medical plan? What is Smart Extender Max? This is especially targeted for those who are already having other company insurance plans, whether purchased on own, your company insurance, or you plan to cover your medical bills in cash. You have a choice for SEM to kick in when your medical costs in a year goes above a certain limit (or called a deductible). It is comparable to a powerbank that extends your smartphone’s battery life significantly no matter what model your smartphone is. Which deductible option do you need? You have no medical insurance and are willing to pay the first 60k per annum in cash. You can now get SEM60 that covers all medical costs above 60k. Your current medical plan covers 100k per annum, you will want to get SEM100 that covers all medical costs above 100k. Your current medical plan covers 150k per annum, you will want to get SEM150 that covers all medical costs above 150k. It is not a medical card & you will need to pay 1st for your medical costs before submitting your bills for claims. You can request for a Guarantee Letter which is given at company’s prerogative. Max entry age 70 next birthday. Age 61 above subject to medical checkup. Coverage only until age 80 next birthday. Consider SEM if your primary medical/group insurance has low limits OR if you are self-funding your medical costs. SEM at a low cost covers high annual medical limit and gives you unlimited lifetime medical coverage from as affordable low as 100/mth. E&OE. For educational purposes only. Q: I have my own/group insurance plan & I purchased SEM. Why did I need to pay part of the costs even though I have both my own/group insurance and SEM? A: SEM kicks in as an annual deductible. There is an unlikely but possible scenario that can occur if you made medical claims prior to the current SEM policy year and then made more claims in the SEM policy year. It is advisable to coincide the SEM policy anniversary with your existing medical plan policy summary to avoid this possibility. Queries on Smart Extender Max? 1) can we just buy this GEL Smart Extender by itself or we need to buy another GEL basic policy? Hi Agnes. Thanks for your query. I assume you are referring to Smart Extender Max (There is a different rider with a similar name called Smart Extender). SEM is a rider which can be attached to a basic policy with as low as RM12,000 basic sum assured. 2) Can we still buy this policy without having other medical policy as the base? E.g. SEM60k, If medical bill is RM100k, we pay RM60k from our pocket (assuming we don’t hv any medical policy) & balance RM40k we claim? You don’t need to have any other medical policy. 1) Under “Pro” section it states no life time limit. So what is the RM1 million coverage stated in the red banner? 2) is RM100 p/ Mth standard premium for everyone or it is just an example? 1) The RM1m coverage is referring to the medical annual limit. Depending on your deductible option it ranges from RM600k to RM2m. 2) The 100 p.m. is an example. It depends on your deductible option, age, occupation, health & lifestyle factors. For most people who are healthy it is around 100 p.m. Although the names are similar, SE & SEM are actually different. Your query would be more towards Smart Extender. Your base medical coverage of SMX200 (Smart Medic Xtra) would cover your first RM120k medical bills. SE would cover up to RM1.2million (medical annual limit). You would only need to pay for charges above RM1.2m in a year. Every year your limit refreshes (thus the unlimited medical lifetime limit).